Cheryl Moon-Sirianni began her PennDOT career in 1987 as a civil engineer trainee in District 10. She joined District 11 in 1989 as a contract management engineer. Since then, Moon-Sirianni has progressed through the organization as a senior project manager and assistant district executive for design. Additionally, she was the acting director for the Bureau of Project Delivery for several months in 2012. 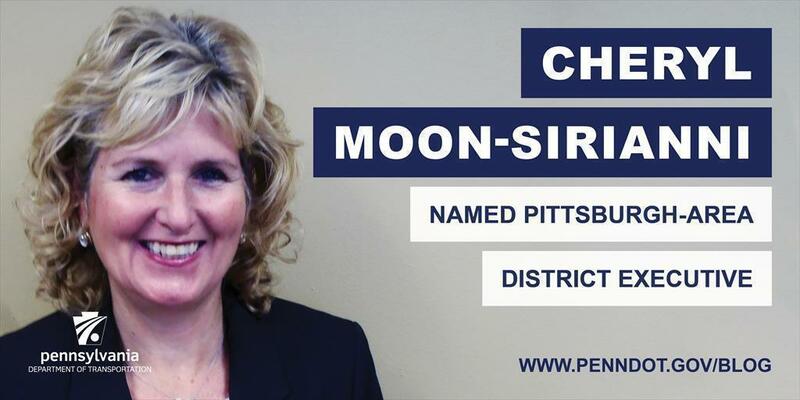 On November 2, Secretary Leslie S. Richards named her district executive for District 11, which covers a three-county Pittsburgh region. As district executive, Moon-Sirianni oversees over $370 million in construction projects, 2,569 miles of roadway, 1,796 bridges, and four tunnels in Allegheny, Beaver, and Lawrence counties. More importantly to Moon-Sirianni: She is responsible for 800 men and women who work in the district. "I am extremely flattered and honored to be selected for this privileged position," she said. "I have always had an admiration for the employees of the department and District 11, especially because it takes special people to dedicate their careers to public service. My goals for this position are to continue to support this hard-working staff and to sustain the high level of quality and effort that they always put forth." As leadership is one of Moon-Sirianni's many qualities, she also is a dedicated advocate for diversity in the workplace​. She has been the moderator for the past three Women's Forums for Architecture, Engineering and Construction professionals in the Pittsburgh area. Throughout her career, she has focused on professional development and leadership training through involvement with the PennDOT Leadership Academy for Supervisors, AASHTO’s Leadership Academy, and the Leadership Development Institute for Women. Although extremely humbled by her professional experiences, others in the field have recognized Moon-Sirianni's outstanding accomplishments. She was given the American Society of Civil Engineers Service to the People Award in 2006, and was a nominee for the White House Champions of Change, Connecting Transportation and Ladders of Opportunity National Award in 2014. She's also received the Engineer of the Year Award from the Engineers Society of Western Pennsylvania in 2015, and in 1996, she was recognized with the Secretary's Award for Excellence. Outside of PennDOT, Moon-Sirianni is a member of the American Society of Highway Engineers and the Engineers Society of Western PA. She also is on the board of directors of the Oakland Transportation Management Association and an advisory board member of the Penn State University Beaver Campus, where she chairs the Recruitment and Retention Committee.